These new Turbo NAS models can accommodate up to eight 2.5-inch drives and offer excellent performance and features in a small package. QNAP Systems announced last Friday a triad of high-performance SSD NAS models for 2.5-inch drives. These are the 4-bay TS-453S Pro and TS-451S, as well as the 8-bay TS-853S Pro. According to QNAP's product manager Jason Hsu, "The new SSD NAS series features an exclusive hardware design that allows users to easily upgrade their RAM to enjoy smoother multi-tasking operations, especially for heavy users who run lots of multimedia applications." Designed to host 4 or 8 SSDs, these devices can also work with classic hard drives or hybrids that use the 2.5-inch form factor. They feature Intel processors, RAID 5 capability, HD Station-powered home theater multimedia experience, as well as QNAP's QvPC Technology that allows a Turbo NAS to be used as a standalone PC. Compared to the existing TS-453 Pro, the new TS-453S Pro has the following advantages: uses 50 percent less space, is 45 percent lighter, has a lower price and needs 62 percent less power. According to the official press release, the TS-451S will reach end users "within a month," but pricing has not been announced. Unfortunately, there is no public information about availability and pricing of the other two models, either. Taipei, Taiwan, November 28, 2014 – Responding to the booming development of SSDs and the growing demands from users, QNAP® Systems, Inc. has announced the TS-451S Turbo NAS, a 4-bay NAS that is optimized for high-density 2.5" SSDs and features an Intel®Celeron® 2.41GHz processor. 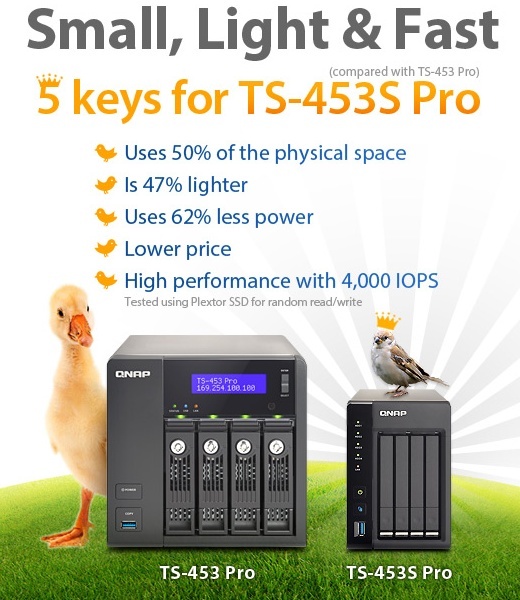 Meanwhile, QNAP’s powerful SS-x53 Pro series (SMB models that are optimized for high-density SATA 6Gb/s 2.5" SSDs) have been renamed the TS-453S Pro (4-bay) and TS-853S Pro (8-bay) respectively to assist users in quickly recognizing different options in the same product category. "Users can enjoy numerous benefits when using SSDs in a Turbo NAS, including a smaller physical size to host at least 4 SSDs, higher-density storage capacity, RAID 5 configuration for data protection, quieter system operations, a home theater multimedia experience with the HD Station, and the exclusive QvPC Technology that allows the Turbo NAS to be used as a PC," said Jason Hsu, product manager of QNAP. The TS-x53S Pro series can also work silently and reliably with 2.5" hard drives as well. "The new SSD NAS series features an exclusive hardware design that allows users to easily upgrade their RAM to enjoy smoother multi-tasking operations, especially for heavy users who run lots of multimedia applications," added Hsu. Compared to the 3.5"-drive-designed TS-453 Pro, the TS-453S Pro provides a more affordable price, takes up half the physical space, and when exclusively using SSDs delivers 4,000+ IOPS (random read/write) at the equivalent total cost of a non-SSD NAS. The TS-451S will be distributed to QNAP’s worldwide sales channels immediately and should be available for end users within a month.